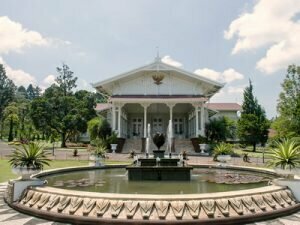 Cipanas Presidential Palace is located in the village of Cipanas, the Sub-district of Pacet, the regency of Cianjur, in the slope of Mount Gede, West Java from an assistance constructed in 1740 by a landlord from Dutch, Van Heots, at the height of 1,100 meter above the sea level, in the area of approximately of 7,760 square meters. In 1916, during the period of Dutch Government, the three buildings were constructed: the Pavilion of Yudistira, the Pavilion of Bima, and the Pavilion Arjuna. In 1954, during the period of the first Indonesia President Ir. Soekarno, a building adorned by stone of ’speckles’ was built. The palace was built surrounded by beautiful scenery of the nature, fresh air, with the back ground of Mount Gede. In the area of palace forest, until 2001, based on the catalogue alphabetically published by the Presidential Palace cooperated with the Indonesian Institution for Sciences (LIPI) recorded 1,334 specimens, 171 species, 132 families, and 61 classes. Besides surrounded by beautiful environment, the palace was channeled by hot water as a place for take a rest and stop over for President and Vice President and their families, also heads of state of neighboring countries visiting Indonesia. In 1971, the Queen Yuliana spent her time to stop over. Gedung bentol is located behind the Main Building in the mountain slope, so that this building is higher than other buildings. It was created by two native architects, RM. Soedarsono and F. Silaban. The surrounding is so silent and still. This situation was used by President Soekarno to arrange some plans and strategies to bring this country that he flared up in state speeches, in every commemoration of proclamation day. 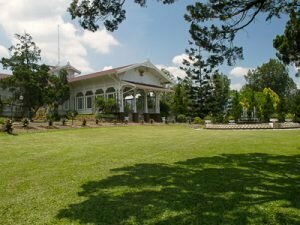 Behind the Main Building, there are some other buildings, but the Hot Water Bathing containing mineral has the most important role for the existence of the Cipanas Presidential Palace. The benefit for the health and the freshness of the body is very natural, therefore, to catch with water from the natural resources, two bathing building was constructed, one of the building is specially made for bathing for President and Vice President and their families, while other bigger building is for groups of people accompanying President and Vice President. Cipanas Palace has a different story, like the rest house in Bogor, the construction of the building was also initiated by van Imhoff. But because of the insufficient cost, then the construction was stopped. Less known by whom, when and how the palace was completed. What is known is that the land purchase was carried out in 1740. This building was designated as the Presidential Palace and is used as a resting place for the President or the Vice President and his family after Indonesian independence. Every room in the palace is furnished with furniture made of wood. The palace is decorated with various collections of Jepara carvings and paintings of Indonesian art maestro like Basuki Abdullah, Dullah Sujoyono, and Lee Man Fong. 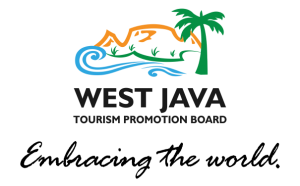 Travelers will be shown around by a local guide saw the relics of Soekarno, presidential retreat, the natural thermal baths, museums, parks and forests cactus.